On Monday we went along to a new messy arts and crafts class in our local area. The classes are brand new and this was the first one to be run. They are suitable for babies 0-5 years and most of the materials and resources are edible, which is perfect for little munchers like little Bee. The class is held in a Church hall which is fairly sizeable and allows plenty of room for the messy mayhem. 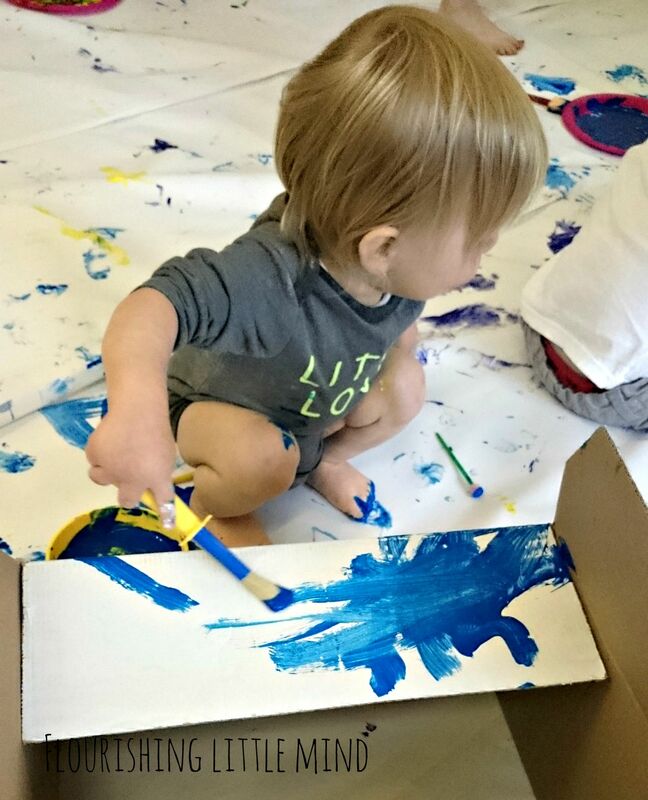 the floor is completely lined with white paper and allows little ones to paint on the floor too. There are different messy stations and the children are free to wander around and explore as they please. There are ‘wet stations’ and ‘dry stations’ which provide a good range of sensory experiences. The children at the class had a ball, some of them were covered from head to toe in paint. I saw one little guy having the best time in the coloured spaghetti, it was in his hair, he was squeezing it and throwing it in the air. All the children moved around easily from station to station and seemed to love every minute. I’ve mentioned before that little Bee is a rather reluctant customer when exploring messy materials. I decided it would be best to take him along to a messy arts and crafts session to see if this helped . My thinking was that he may be more willing to explore and investigate the materials in a different environment, because although I try to be relaxed and laid back about messy play in the house, I still hold back a little with the fear of walls and ceilings being splattered with all sorts of stains. I also figured that he may see other children getting stuck in and want to join in too. So.. This kind of worked, as he was definitely more enthusiastic about using the painting materials than I thought he would be. He got quite excited about painting a cardboard box and he almost fell in at one point. He was also more willing to stick his hand in the gloop than he’s ever been before, although I think he was just after the wooden spoon which was in the tub. I tried getting him to put his feet into the warm squidgy oatmeal but he wasn’t having any of it. going by his reaction, you’d have thought I had put his feet into a bucket of snakes! Despite this I think he had a great time, (I certainly did) he was much more adventurous than usual and I hope next time he explores more new and exciting materials. We’re already booked into the class for next week, and if you’re in the local area i would recommend the class for little ones. It was a great start to our week!